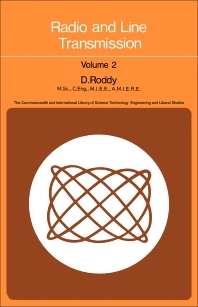 Radio and Line Transmission, Volume 2 gives a detailed treatment of the subject as well as an introduction to additional advanced subject matter. Organized into 14 chapters, this book begins by explaining the radio wave propagation, signal frequencies, and bandwidth. Subsequent chapters describe the transmission lines and cables; the aerials; tuned and coupled circuits; bipolar transistor amplifiers; field-effect transistors and circuits; thermionic valve amplifiers; LC oscillators; the diode detectors and modulators; and the superheterodyne receiver. Other chapters explore noise and interference in the transmission; the negative feedback that occurs in amplifier; and the methods used in the field of electronic measurements. This volume will be very valuable to technicians in the electrical engineering industry. Dermot Roddy is the Science City Professor of Energy and Director of the Sir Joseph Swan Institute at Newcastle University, UK. He was previously responsible for the development of a renewable energy and alternative fuel programme for Renew Tees Valley Ltd, UK, and he is noted for his research in optimisation and control.